A1. Been There . . . . . . . ? A2. Ain't No Crime . . ? A3. Monty . . . . . . . . . . . . ? A4. Dramaz . . . . . . . . . . . ? A5. For Da Family . . . . ? A6. Crusading . . . . . . . . ? A7. Inner City Blues . ? A8. Jam On It . . . . . . . . ? B1. Mont Man . . . . . . . . . ? B2. Ron Beat . . . . . . . . . ? B3. Spinner . . . . . . . . . . ? B4. Gettin Hot . . . . . . . ? B5. Take Your Time . . . ? B6. Turtle Man . . . . . . . ? B7. Been There Part 2 ? B8. Urbaink . . . . . . . . . . ? B9. Fletcher (Bonus). . ? 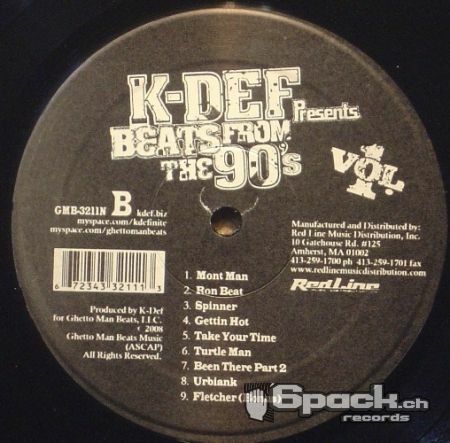 Suche nach K-DEF (REAL LIVE) in meinem Shop.